A research team from the Kansas State University College of Veterinary Medicine is using a $25,000 grant from the American Veterinary Medical Foundation to improve canine pain relief, including finding an opioid formulation that can be used safely in dogs while decreasing risks in people. 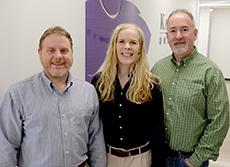 The team of Butch KuKanich, professor of veterinary clinical pharmacology; Kate KuKanich, associate professor of small animal internal medicine; and David Rankin, clinical associate professor of veterinary anesthesiology, have already identified a drug formulation to control mild to severe pain in dogs via oral administration. The team found methadone combined with a pharmacokinetic enhancer produced prolonged effects in dogs when administered orally. Before this discovery, the poor absorption and short duration of opioids in dogs have resulted in inconsistent pain relief after oral administration. "Other drugs such as nonsteroidal anti-inflammatory drugs, or NSAIDs, are not always effective, may not be well tolerated in older dogs or dogs with organ dysfunction, and occasionally produce serious adverse effects," said Butch KuKanich. "Our initial results are very promising, but with the abuse of opioids today, we not only want a formulation that works in dogs but one that also will not contribute to consequences of inadvertent drug exposure or drug misuse in humans." That's what the researchers will work on with the grant from the American Veterinary Medical Foundation, which was made possible from the estate of Susan Isaac Maylahn and in memory of her Samoyed, Igloo. "Without Ms. Maylahn's love of animals and her estate's generous donation to the American Veterinary Medical Foundation, which is also dedicated to helping veterinarians and animals, we would not be starting the next step," Butch KuKanich said. "The entire research team is excited to continue the difficult work of optimizing the analgesic effects of the formulation in dogs while making a safe formulation for both the dogs to be treated and the people handling the formulation." Rankin believes many dogs are under-medicated for postoperative and chronic pain, including arthritis, because of a paucity of reliably efficacious analgesics. "This study has the potential to really have an impact on pets' quality of life," Rankin said. "The ability to provide effective pain control for our canine patients is of utmost importance in companion animal medicine," Kate KuKanich said. "This novel opioid strategy not only shows great promise in helping us to minimize our patients' pain, but also addresses the larger public health concerns of minimizing opportunities for opioid abuse potential in our communities."